Dutch scholar and publisher; member of a family of printers; lived at Amsterdam in the seventeenth and eighteenth centuries. 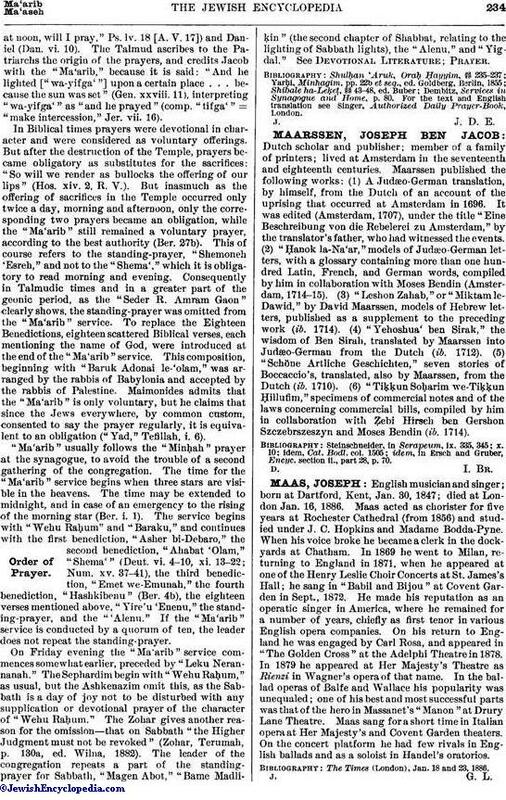 Maarssen published the following works: (1) A Judæo-German translation, by himself, from the Dutch of an account of the uprising that occurred at Amsterdam in 1696. It was edited (Amsterdam, 1707), under the title "Eine Beschreibung von die Rebelerei zu Amsterdam," by the translator's father, who had witnessed the events. (2) "Ḥanok la-Na'ar," models of Judæo-German letters, with a glossary containing more than one hundred Latin, French, and German words, compiled by him in collaboration with Moses Bendin (Amsterdam, 1714-15). (3) "Leshon Zahab," or "Miktam le-Dawid," by David Maarssen, models of Hebrew letters, published as a supplement to the preceding work (ib. 1714). (4) "Yehoshua' ben Sirak," the wisdom of Ben Sirah, translated by Maarssen into Judæo-German from the Dutch (ib. 1712). (5) "Schöne Artliche Geschichten," seven stories of Boccaccio's, translated, also by Maarssen, from the Dutch (ib. 1710). (6) "Tiḳḳun Soḥarim we-Tiḳḳun Ḥillufim," specimens of commercial notes and of the laws concerning commercial bills, compiled by him in collaboration with Ẓebi Hirsch ben Gershon Szczebrszeszyn and Moses Bendin (ib. 1714). idem, in Ersch and Gruber, Encyc. section ii., part 28, p. 70.